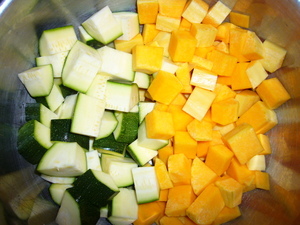 Cut up pattipan squash, removing seeds that are in the middle. Add the cubed zuch. 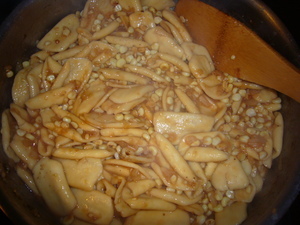 Toss with oil, salt and pepper. Spread out on cookie sheet. 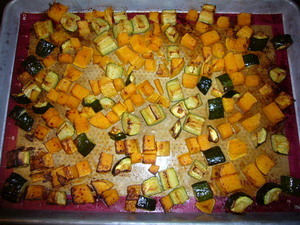 Roast in the oven till squash starts to brown on top. 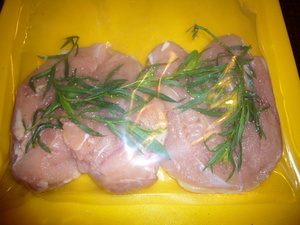 If using Sous-vide chicken breasts, remove from the bag, dry, and pan fry to give chicken color. Otherwise, Use brined deboned chicken breasts. Preheat pan to med high. Dry breasts and toss with oil, salt and pepper. Lightly oil the pan and saute chicken breast. Place browned breasts into the oven to finish cooking. When done, remove from oven, and set breasts aside. Return uncleaned pan to the heat. There should be just a little fat in the pan. If not, add some. Add the diced onion and saute. Since there's the brown chicken fond in the pan, make sure you don't burn it. It may loosen with the moisture from the onions. When the fond can take no more heat (onions may not be done yet), add the cognac and flame. When flames die down, add corn kernels, and finely minced tarragon. Add chicken broth, and reduce further. While broth reduces, drain pasta. Add about 1/2 can of diced tomatoes (Progresso roasted tomatoes works well) and cook for a few minutes, stirring. 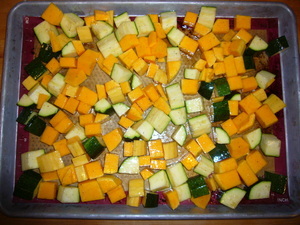 Add the pasta and the roasted squash/zucchini to the pan and toss. 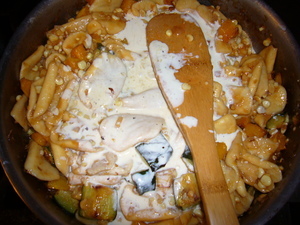 Cook briefly to finish the pasta if needed and add the cream. Adjust seasoning with salt and white pepper. 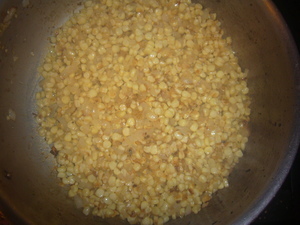 When it reaches the proper consistency, remove from heat and stir in the butter, a little at a time. Plate the pasta. Slice the chicken breasts, and arrange on top of the sauce. Sprinkle plate with chives. Made this last night with two changes. 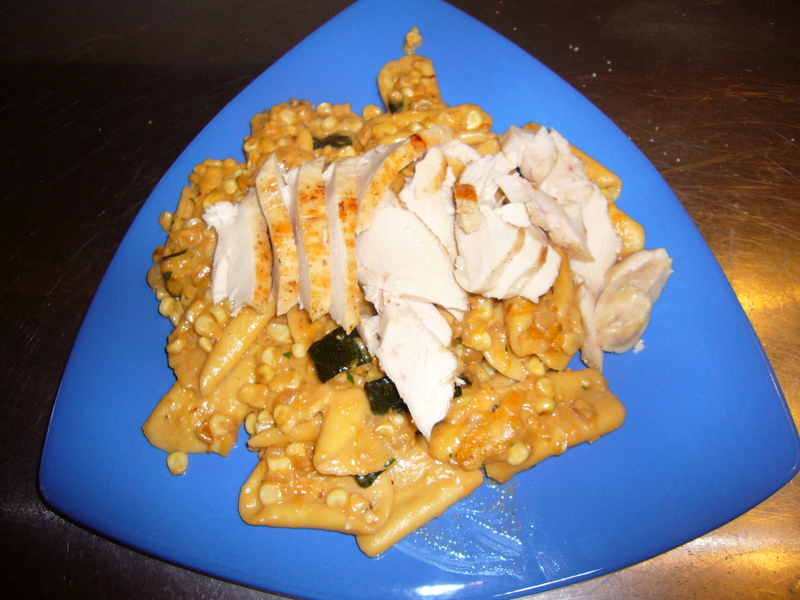 Instead of the pati-pan and zucchini, I used butternut squash which worked fine. Second, I used Spanish Tarragon instead of French. I think I prefer the French which has a more pronounced flavor.